TORONTO–(BUSINESS WIRE)–Homeowners craving a contemporary version of old-school elegance and sophistication can look to DULUX® Paints by PPG for trending paint colour inspiration. 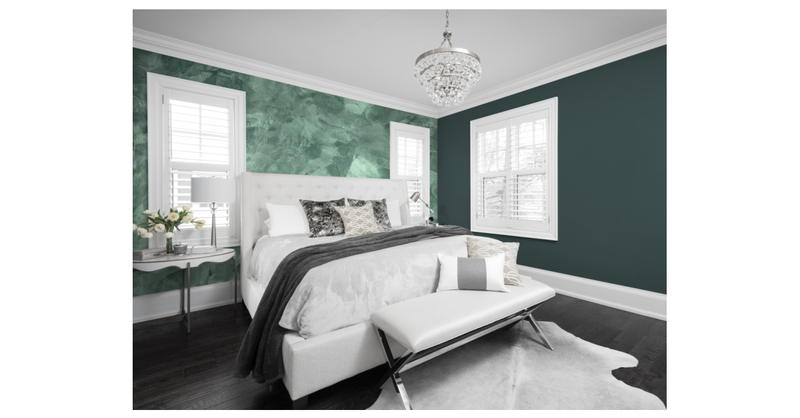 The leading national brand has named two deep green tones as Colours of the Year for 2019: Night Watch (DLX1145-7), a deep green-black from the brand’s new colour collection, and Mojito Shimmer (036VS), a glistening, frosted dark green from the Dulux Effects Finishes VENETIAN SILK™ collection. Night Watch, a colour truly inspired by nature, emulates the feeling of lush greenery and delivers a calming yet invigorating sense of euphoria. With the ability to be used as a neutral, yet having the intensity to also stand out as an accent colour, Night Watch couples well with soft grey-browns or warm sandy beiges, such as Elusion (DLX1005-2) or Earthy Cane (DLX1103-4), or intense rust tones like Lucky Penny (DLX1201-7) from the Dulux Paints by PPG colour palette. Versatile enough to work in either a traditional or contemporary setting, Night Watch works best in bedrooms and living areas as well as on kitchen cabinetry. It also pairs particularly well with metallic finishes and pewter tones and creates a sophisticated “welcome” and dynamic statement against brick or stucco when painted on the front door. According to Tustin-Fuchs, Mojito Shimmer is the perfect complement to Night Watch as it features a distinctive, lustrous, frosty-green coating that adds unprecedented class and wow factor to walls. “As a stand-out colour in the Dulux Venetian Silk line, there is nothing else like Mojito Shimmer on the market,” Tustin-Fuchs explained. Dulux Venetian Silk finish is made from new technology that enables users to transform their walls in a single day, infusing them with light-reflecting colour and texture to match any personal taste. Available in 40 striking, light-animating colours, the finish produces a silky layered effect that is smooth to the touch, creating a distinctive multi-toned and luminous surface that adds striking depth to walls. Tustin-Fuchs recommends painting a feature wall in Dulux Venetian Silk Mojito Shimmer and the remaining walls in Night Watch. For a greater contrast, he suggests complementing Mojito Shimmer with a refined, urban neutral, such as off-white Hourglass (DLX1022-1), silver-blue Nautical Star (DLX1036-3) or a lighter grey like Thin Ice (DLX1001-3) by Dulux Paints. “Even if you don’t change anything else in the room, the transformative effect of applying Dulux Venetian Silk finish to just one wall is remarkable,” Tustin-Fuchs said. To receive more information about Dulux Paints’ 2019 Colours of the Year, explore the brand’s full 2019 colour palette or experiment with the creative possibilities of Dulux Venetian Silk finish, visit https://www.dulux.ca/diy/summer-projects. Until September 9, 2018, Dulux Paints by PPG is offering major discounts on its Dulux Effects Finishes paint products. For more details and to find a store near you, visit www.dulux.ca/diy/promotions. Find Dulux Paints by PPG in more than 260 company-owned Dulux Paints and BÉTONEL® / Dulux Paints stores across Canada serving the consumer and professional markets. No matter where the Dulux brand is sold in Canada, it offers an extensive portfolio of high-quality products and services to the marketplace. PPG’s architectural coatings business in the U.S. and Canada is an industry leader in residential and commercial coatings, delivering the latest technologies and operational advancements through its strong portfolio of brands. It manufactures and sells interior and exterior paints, stains, caulks, repair products, adhesives and sealants for homeowners and professionals. Its distribution network includes more than 15,000 touchpoints through company-owned stores, independent dealer locations and major home improvement centers across the U.S. and Canada. Visit ppg.com/ac for more information. Dulux is a registered trademark of AkzoNobel and is licensed to PPG Architectural Coatings Canada, Inc., for use in Canada only. Venetian Silk and Liquid Metal are trademarks of PPG Architectural Finishes, Inc. Bétonel is a registered trademark of the PPG Group of Companies. Next articleUPDATE — WeedMD and Phivida Sign Definitive Agreement on Cannabis Beverages Inc.